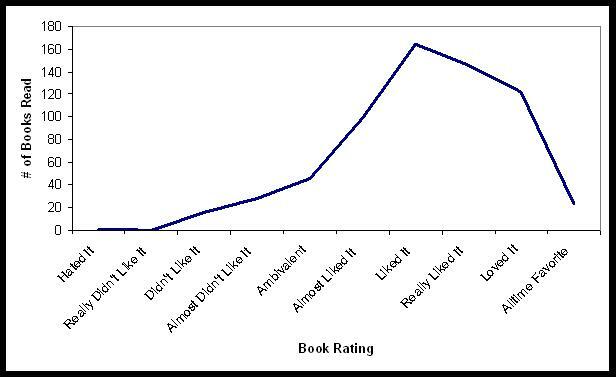 Jackie over at Farm Lane Books Blog asked the question “What shape is your rating system?” She was wondering what the aggregate data of book ratings would look like represented graphically. So I went to my trusty spreadsheet that contains all the books I have read since 1995 and did a quick little chart that shows how my book ratings are distributed. From the chart you would think that I never met a book that I didn’t like. But, it turns out that I am much like many the commenters on Jackie’s blog. I don’t finish books I don’t like so they don’t show up on my booklist and therefore don’t show up on my ratings chart. 1995! I drool in envy at your spreadsheet organisational ability. Whilst I have a list of books from Jan 08 onwards I have never been able to agree on a rating system with myself. This might just give me the impetus to finally do so!